I was at the dog park the other day with my two black Labs. There were several dogs involved in a game of tag, rolling in the grass and overall having a good time. A young yellow Lab was having a great time swimming in the water bowl. Imagine a 50lb dog trying to swim in a water bowl. It’s quite amusing to watch. Although I thought this behavior was adorable, his owner spent a good deal of time near the water bowl so she could correct him while he was swimming. I imagine swimming in the water bowl at home can be quite problematic. Marketing is a lot like training a dog. The dog owner spoke to her dog constantly while he approached the water bowl and whether or not he swam in it, she had an on-going commentary. In addition to a wordy message, she used different words each time. He had no idea what she wanted him to do and most likely he didn’t even know she was talking to him. To the dog, she had become background noise. In today’s fast-paced world, we are bombarded with more communication than ever before. In order for our message to be heard, it needs to be clear, concise, and consistent. Clear- what message do you need to be received? Concise– How can you convey that message using few words? If we over communicate people (and dogs) will tune us out. I read somewhere that a message needs to be received three times before it can be heard. If we vary our message, people (and dogs) will be confused. There’s no need to say, “Don’t do that. No swimming in the water bowl. Keep your feet out. Eh, hey no no. Don’t do that, stop, go play” when a simple firm, consistent, “No!” with redirection will suffice. Keep your marketing messages clear, concise and consistent and you will be well on your way to increasing your revenues. Having recently acquired Rapid Boat Rentals in Summerland Key, FL, MiLo Watersports was in need of a complete branding launch and marketing campaign. Tina Newberry Designs stepped in and first established the company logo and colors. From there business cards, roadside banners, t-shirts, vehicle magnets and a website were developed. in all cases the logo was displayed and the website listed. Next, the customer reservation and registration forms were redesigned in Microsoft Word to enable easy updates and to display the company logo. With the initial materials in place, Tina Newberry Designs set to establishing a web presence. Knowing it takes several months for search engines to index websites, Tina Newberry Designs took on two Google Ad pay-per click campaigns. The first ad campaign is on Google Places and relates to a visitors physical location. If the potential customer is in the lower Keys or searches for places in the lower Keys, the MiLo listing is present and banner ads are displayed. 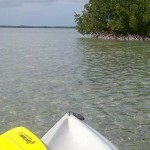 The second campaign revolves around boat rentals or kayak rentals in the lower Keys or Summerland Key area. Combined the two campaigns average 5-6 clicks per day and in the first week resulted in $2000 worth of business for MiLo Watersports.